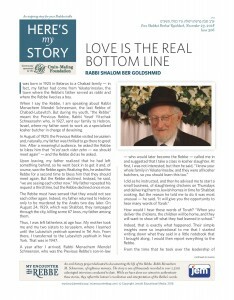 I was born in 1925 in Belarus to a Chabad family – in fact, my father had come from Yekaterinoslav, the town where the Rebbe’s father served as rabbi and where the Rebbe lived as a boy. When I say the Rebbe, I am speaking about Rabbi Menachem Mendel Schneerson, the last Rebbe of Chabad-Lubavitch. But during my youth, “the Rebbe” meant the Previous Rebbe, Rabbi Yosef Yitzchak Schneersohn who, in 1927, sent our family to Hebron, Israel, where my father went to work as a specialized kosher butcher in charge of deveining. In August of 1929, the Previous Rebbe visited Jerusalem and, naturally, my father was thrilled to go there to greet him. After a meaningful audience, he asked the Rebbe to bless him that “m’zol zach vider zehn – we should meet again” – and the Rebbe did as he asked. Upon leaving, my father realized that he had left something behind, so he went back in to get it and, of course, saw the Rebbe again. Realizing this, he asked the Rebbe for a second time to bless him that they should meet again. But the Rebbe declined. Instead, he said, “we are seeing each other now.” My father repeated his request a third time, but the Rebbe declined once more. The Rebbe must have sensed that they would not see each other again. Indeed, my father returned to Hebron only to be murdered by the Arabs two day later. On August 24, 1929, which was Shabbat, they rampaged through the city, killing some 67 Jews, my father among them. Thus, I was left fatherless at age four. My mother took me and my two sisters to Jerusalem, where I learned until the Lubavitch yeshivah opened in Tel Aviv. From there, I transferred to the Lubavitch yeshivah in New York. That was in 1947. Indeed, that is exactly what happened. Their simple insights were so inspirational to me that I started writing down what they said in a little notebook that I brought along. I would then report everything to the Rebbe. I think the most important piece of advice that I received from him concerned ahavat Yisrael – how to love your fellow Jew. That was the Rebbe’s decree, and I didn’t ask any questions. I understood that if I lose money this way, I will get it back some other way. What was paramount to me was that Rebbe said to do it like this, so that’s the way it had to be done. And somehow it worked out well for everybody, just as the Rebbe promised. I had another customer – a woman with many children who was always buying a lot of meat. And then, all of a sudden, she started buying only chicken wings, the cheapest thing in the shop. And, in fact, many years later she sent me a check for what she owed. But, long before she did, I knew that what the Rebbe said was absolutely right – it didn’t cost me money if they didn’t pay, because even if I didn’t get it this way, I got it another way. Rabbi Shalom Ber Goldshmid (1925-2011) and his late wife Rivka lived in Brooklyn, where he operated a butcher store for many years. He was interviewed in August 2011.